How many Twitter followers do you have? How many Facebook friends do you have? How many would be willing to die for you? Welcome to the world of Real Account – A world where all social networking services have been unified under a single, universal, all-encompassing, and deadly service. Ataru Kashiwagi is a friendless high school student, living alone with his sister. His only real social interaction happens online with his 1,540 followers on Real Account, a sort of Twitter/Facebook amalgamation. One day, Ataru is summoned into a virtual world with 9,999 other users by a dark figure dressed as the smiley-faced mascot of Real Account, where he is forced to play a deadly game. The rules are simple, if anyone dies in the virtual world, they die in real life – as do all of their Real Account followers. As an initial test, the game's host gives 3 minutes for any of the followers out in the real world of the summoned 10,000 to unfollow and save their own hides. But if anybody loses all of their followers, they die. 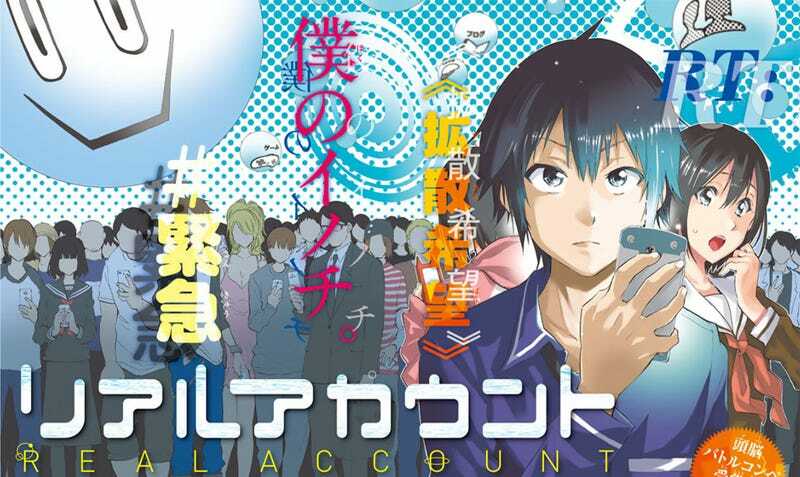 Real Account is a bit of a social commentary wrapped in your standard Battle Royale or Sword Art Online-esque "death game" plot. It's an interesting concept – pointing out the virtual nature of online social experiences and society's infatuation with something that, when put to the acid test, is for the most part superficial. However, the story kind of blows it wad in the first chapter. Yes, the "followers" and "friends" we have online can be an easily-shattered illusion, but the real test is taking things to the next level. The manga is very plot and concept driven which means the characters are generally your basic caricatures: you have the shy loner protagonist, the kind supportive sibling/heroine, the mirthful sadistic antagonist, etc. You can pretty much guess where the story is going to go from there. Real Account is quite interesting, conceptually, and in initial execution, but that's about it. It's a fun read so far, but it's probably not going to resonate all that much unless you're someone like the main character – a loner whose entire social life is virtual. Otherwise, you're more likely to find it a neat idea and move on. The manga seems to revel in pointing out how cruel and heartless people can be when they don't really know each other, but if you've spent any amount of time on an FPS server, you kind of knew that already. Notes: The first chapter can be read for free online here (Japanese only).